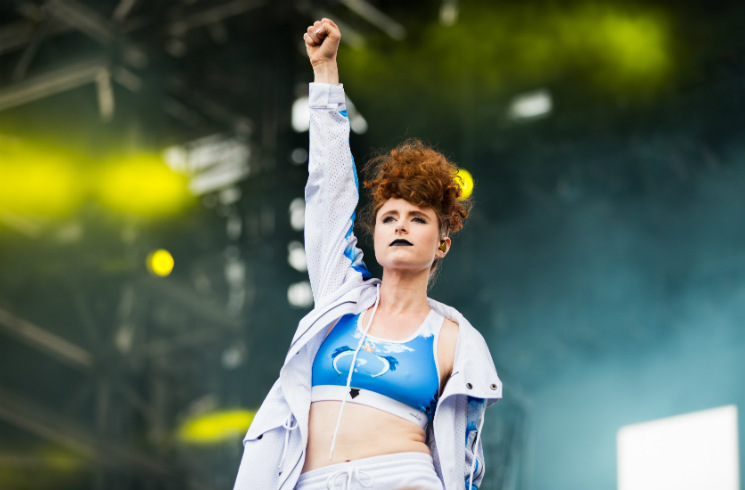 With only a pair of dancers in tow and someone triggering the backing tracks to her songs out of view, Kiesza's stage setup may have seemed pretty minimalist and meek situated in the middle of Festival d'été's towering Bell Stage. But such a simple setup allowed all eyes to be on the Canadian singer as she took the stage midway through the Full Flex Express's daylong spot, rousing a crowd that already seemed to be tuckered out from an afternoon spent partying on the Plains of Abraham. It's been almost a year since the release of her major label debut, Sound of a Woman, but judging by the youthful crowd in attendance, her album (or, at least, its singles) are still at the top of their hit list. Delivering one of the most engaging performances of the festival so far, Kiesza sounded like the second coming of C+C Music Factory on stage, her and her fellow dancers' synchronized steps matching the throwback '90s sounds of tracks like "The Love," "Over Myself" and "Vietnam" perfectly as day turned to dusk. Saving the best for last, the screens on stage lit up for the first time all set, flashing scenes of rockets floating in space and flying into Kiesza's brain and back again as she performed her biggest hit to date, "Hideaway," for the Festival d'été crowd. It was the most excited they'd been all afternoon and evening, and proved that good stage presence can conquer lightshows and gimmicks any day of the week.